How can you not love a color with Wisteria in its name? Wisteria Wonder fills a real gap in the Stampin’ Up! color palette, and I know I’m not the only person who is happy about that. 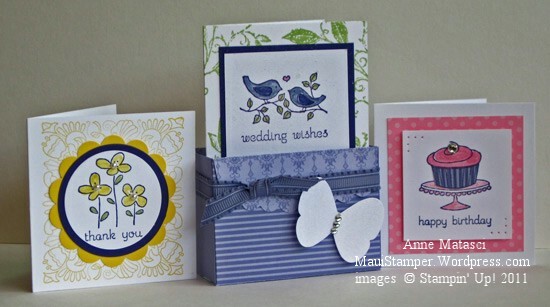 I wanted to explore how each of the 2011-2013 In Colors coordinate with the Stampin’ Up! color families, so I came up with a set of classes that will explore each of the colors in turn. Guess which one will be first? This first class will be Wednesday, August 10 and will feature this note card set (made with the Easy Events stamp set) and two other projects. Cost is $10, and you can RSVP at my Online Store. Just click on the event in the calendar on the landing page, and it will take you to the class description and a big ol’ RSVP button. Hope to see you there! Looks like I will miss out on a great class! I will be there in spirit! What cute cards for a great class!! Too bad we’re not on the same island!